Toyohara Kunichika (1835-1900) Six Selected Flowers: Lily and Nakamura Shikan, 1867. Oban. 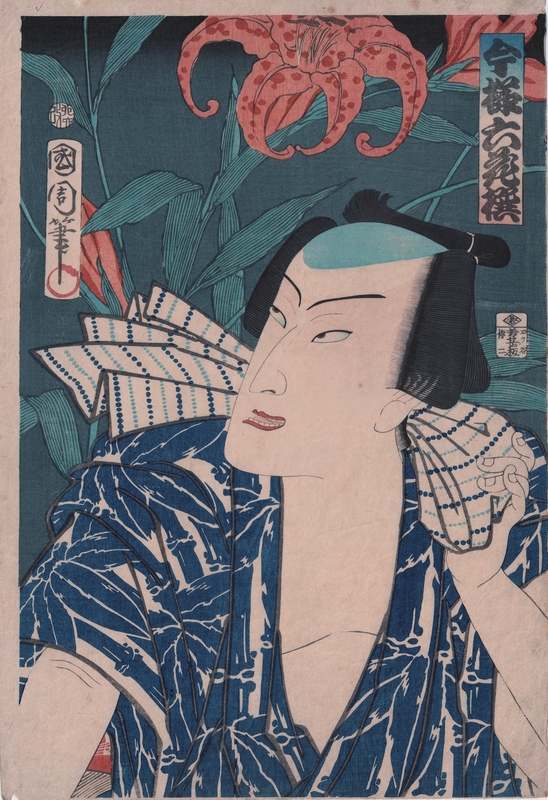 A beautiful print by Kunichika, quite early, showing still the influence of Kunisada, the realisation of the composition and the tight rendering of the flowers and the background is especially pleasing. The print is from the 1867 series comparing actors with flowers, a style called mitate. The playful nature of these puzzle pictures conceals a darker history since they were conceived as a get-around for some of the stringent censorship of the 1840’s and the early 1860’s when the shogunate was attempting a moral crusade in order to consolidate its crumbling power. The genre survived in lighter form as in this case. There was an earlier series, nearly identical in composition from 1865, similarly comparing six actors with six blooms. In this case, Kunichika compares the actor Nakamura Shikan with the lily. The role here is likely to be that of the raftsman (ikadanori) Shichi. A fine actor portrait (sometimes called yakusha-e). Colour, condition and impression are all fine.